You’re bound to come across conflict at some point in your life, and sometimes it is hard to know how to resolve it. Conflict is more than just a small disagreement – it is a situation in which one or more people involved perceive a threat (such as the end of a relationship). It can arise from differences in values, motivations, desires and more. When a conflict sparks strong feelings, a deep personal need is often at the core of the issue. Although unpleasant, it is a normal part of life; people can’t always agree on everything! This article will offer some advice on how to resolve a conflict. This does not only apply to romantic relationships, but friendships, family, and work relationships. Competing – You have an assertive approach to resolving conflict, and you value standing up for your views and beliefs, or just trying to ‘win’ the conflict. Accommodating – Unlike the competing approach, you are unassertive. This might mean you give in to another person’s requests when you do not agree with them. Avoiding – You do not deal with the conflict; you either disregard an issue, postpone it until another time, or withdraw from a threatening situation. 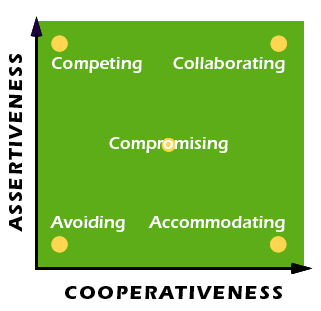 Compromising – You are both assertive and cooperative but to a small extent. Both sides get something that they want out of the conflict, but not everything. You might take something, but also sacrifice something, or find a solution in the middle ground. Collaborating – You believe that it is possible for both sides to come out with what they want. It requires conflict resolution skills based on mutual respect, a willingness to listen to others, and creativity in finding solutions. One factor to consider when addressing the subject is whether it is a good time to bring it up. If the person is stressed, they may not be in the right mindset to deal with the conflict and therefore resent you for it, hindering the resolution. It is usually better to resolve it in person, as opposed to over text (or other forms of social media), as it is easier to expand on your ideas and ask for clarification. When you are discussing the conflict, try to remain calm and listen to what they have to say. This will enable the discussion to run smoothly. Of course, emotions are expressed during conflicts, but showing a lot of anger will not solve anything. Listening to them, as well as explaining your views, will allow you to effectively solve the issue. It is important to gather the full story, as miscommunication might have created the conflict, or prevent it from being solved sooner. You should also aim to resolve the conflict, not prove that you are right. It is easier said than done but maintaining and strengthening the relationship should be the priority. 1. Observations – try to observe the situation objectively, without blaming or judging the others involved. This means that evaluations should not be made on the observations – objective facts give you something to talk about as they are cannot be disagreed on, whereas evaluations can cause disagreement. 2. Feelings – Discuss how the observations are making you feel. If other people become involved in the conflict, it can disrupt the resolution. Others may cloud your judgement and persuade you to do certain things because they believe it is right. They could also gossip about the issue (even if you trust them), and this is often passed on to more people. Although it is important to talk about your feelings, and gain an outsider’s perspective, ensure that they do not cross a line and become a part of it. If a conflict arises in front of other people, who are not directly involved, it is best to wait until you can be alone with the person involved to resolve it. If others are there, it could make them uncomfortable as well as you, and this could create a tenser situation. Appreciations – each person involved puts forward appreciation for something that the other person has done. This starts with a positive tone and fits in with Rosenberg’s idea that people are generally compassionate. Puzzles – this allows people to talk about something that they are confused about or ask them for further information. This means that people will form solutions based on this instead of an unclear picture. Complaints with recommendations – you should discuss what the issue is, and how the other person can help. Not only will this give them the information they need to implement changes and improve the conflict, but the pressure will not only be on them to think of ways to solve the issue. New information – this gives people the opportunity to provide answers and clarity to the puzzles and complaints. Hopes and wishes – you can discuss what you would like to happen, which sets the goals for conflict resolution. You and the other(s) can support each other in achieving the hopes and wishes. This ends the talk on a positive, forward-looking note. Another model to use to ensure that all your goals are met is the ‘Courageous Conversations’ model. As many people find conflict difficult, they often do not express what they really wanted to say, leaving us with a sense of a gap between what we wanted to say and what was said in reality. Explain the gap – Clearly, explain the issue and what you need to talk about. Explore the gap – This part involves questioning and listening from both people about the conflict. Eliminate the gap – You should reach a clear idea on how to move forward from the conflict. Hopefully, you will find this advice helpful – now it is down to you to implement it when facing conflict. As mentioned previously, conflict is a part of life and cannot always be avoided. Rosenberg and Satir’s approaches are used widely to successfully help deal with conflict, so give them a try. Good luck! 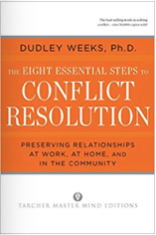 To find out more about conflict resolution, here is a list of ten recommended books about it! 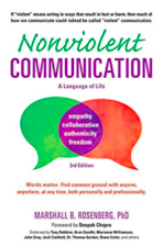 This book is about Rosenberg’s theory of Nonviolent Communication, the idea that people are generally compassionate and only resort to violent communication styles when their needs are not met. It will give you advice for communicating more effectively. In this text, Rosenberg offers insightful stories, anecdotes and practical exercises which will change your approach to communication. Find out how the language you use can build trust, resolve conflicts and strengthen relationships. The New Peoplemaking expresses Satir’s thoughts on self – worth, communication, family systems and the ways in which people relate to each other. It draws upon Satir’s experience with thousands of families around the world, and her ideas about ‘temperature’ in terms of conflict resolution are explored. This book provides an approach, in detailed steps, to help you have tough conversations successfully with less stress. It is a proven approach based on fifteen years of research at the Harvard Negotiation Project. Full of examples from everyday life, this book will help you resolve conflict – whether that be at work at home. 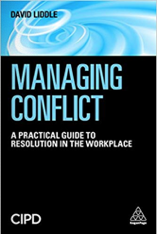 This is a useful book for dealing with conflict at work, including information of effectively communicating with employees, understanding and using organisational politics, and more. There are case studies provided in the book which helps with understanding the key concepts. 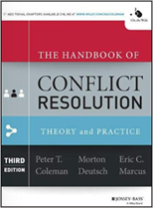 This handbook offers a range of articles on the theory and practice of leading scholars and applies this research to the practical realities of conflict resolution. It explores relevant topics such as power, cooperation, emotion and trust. The text emphasises constructive management of conflicts, and the search for win – win solutions. It is designed to be informative to professionals, as well as accessible to newcomers to this field. In this book, Ury explains his idea that it takes two sides to fight, but a third to stop. The third side can be people not involved in the conflict, or people who are but chose to take the third side. He describes ten roles that each of us can take to prevent conflict. Ury argues that fighting is not an inevitable part of human nature, using his work among primitive tribes and modern corporations to support this. Shapiro introduces a step – by – step method to resolve difficult and emotionally charged conflicts. This guide reveals the idea that there are five hidden emotional forces that strain relations and cause disagreement: vertigo, repetition, compulsion, taboos, assault on the sacred, and identity politics. 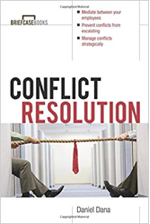 The book provides a proven approach to overcome these forces and reach agreement in challenging personal and professional disputes. This text focuses on conflict in the workplace, which negatively impacts employees. It is a guide for resolving current issues, as well as preventing future instances of conflict. It is full of case studies from major UK and global organisations. This will be useful for HR professionals, but also provides toolkits for employees and unions to help tackle conflict and bullying at work. Long – term unresolved conflicts are damaging to personal happiness and success, whether they are personal or professional. This book demonstrates that problems that will not seem to go away can be resolved in eight steps, including case studies. This is a communication skills handbook that can help to reduce problems with communication. Bolton describes the twelve most common communication barriers and shows how they can damage relationships by increasing defensiveness, aggressiveness, or dependency. 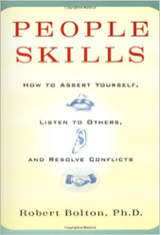 He also explains how to gain the ability to listen, assert yourself and resolve conflicts. These skills will help you communicate calmly, even in stressful situations.